Ingolstadt, June 17, 2012 – In conjunction with the 24 Hours of Le Mans, Audi is presenting the new top model of its recently revised Q5 model series – the Audi SQ5 TDI. Boosted by two turbochargers, its 3.0 TDI produces a brawny 313 hp and 650 Nm of torque between 1,450 and 2,800 rpm. The Audi SQ5 TDI is the first S model in the history of Audi with a diesel engine and will be launched in first quarter of 2013. A Middle East market entry for the TDI is not planned. The powerful TDI, which displaces 2,967 cc, uses a twin-turbo design in which the two turbochargers are connected in series via a flap. Cylinder head cooling, the timing and lift of the intake cam shafts, the pistons, their oil-jet cooling and the piston pins have been specially designed for the high-performance concept. The common rail system develops as much as 2,000 bar of pressure and injects as many as eight shots of fuel into the cylinders per cycle. The 3.0 TDI biturbo has a great sound. This sound is further modulated by a sound actuator in the exhaust system – a loudspeaker in short side channel. 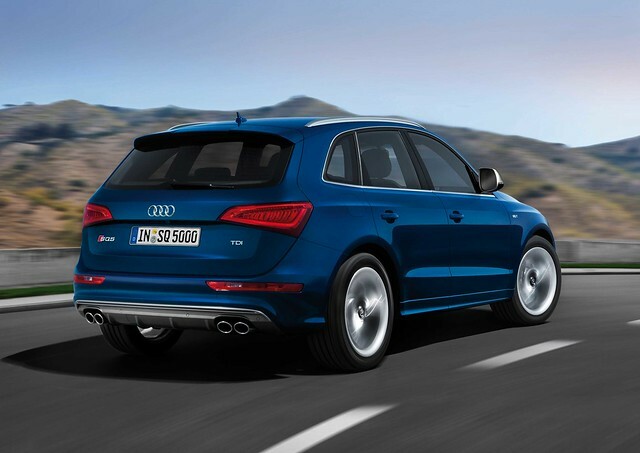 The Audi SQ5 TDI sprints from zero to 100 km/h in 5.1 seconds; top speed is 250 km/h. Fuel consumption is on average just 7.2 liters per 100 km. Innovative thermal management, the start-stop system and the regulated oil pump all contribute to this top figure. A fast and smooth-shifting eight-speed tiptronic and quattro permanent all-wheel drive with torque vectoring transfer the power of the brawny V6 diesel to the road. The electromechanical power steering in the Audi SQ5 TDI is sensitive and highly efficient. The sport suspension lowers the vehicle body by 30 millimeters. The standard 20-inch wheels feature a five parallel-spoke design and are fitted with 255/45 tires. Audi offers optional wheels measuring 21 inches in diameter. The black brake calipers on the front axle sport S badges. The optional Audi drive select system can be expanded upon request to include the dynamic steering system with its steplessly variable steering ratio. The most eye-catching design cues are the platinum gray single-frame grille with its galvanized double bars in an aluminum-look finish, the roof spoiler and the modified bumpers. The high-gloss package and the aluminum-look exterior mirrors accentuate the area around the windows. Audi offers the new top model in the crystal effect paint finishes Estoril Blue or Panther Black. The body includes a high proportion of ultra-high-strength steels, making it very light, safe and rigid. As is typical for an S model, the interior has black trim and exudes a sporty elegance. The headlining is optionally available in lunar silver. The power-adjustable sport seats come standard in Pearl Nappa leather/Alcantara. Leather upholstery in a choice of four colors is available as an option. Brushed aluminum inlays are standard. Options include Carbon Atlas, Piano finish and the new Aluminum/Beaufort wood black trim panels. The instrument dials are gray and include a 3D-design S badge, the needles are white and the pedals and shift paddles have an aluminum-look finish. Additional visual highlights in the interior are the S gear lever knob, the S badges on the door sill trims, the start button and the specially-shaped steering wheel, the S welcome screen and the lighting package. Luggage capacity is as much as 1,560 liters, making the SQ5 TDI the ideal car for sporty and active customers. It is also an unusually powerful towing vehicle, with a rated towing capacity of up to 2.4 metric tons.